Okay, you are a small business owner and you have got two to two hundred employees working for you. Some of these employees may be your salaried employees and some others may be on hourly basis of work. In all such scenario, effective management of (i) time cards (ii) payrolls turns out to be the most challenging, tedious and sensitive task. Today’s post will highlight LionClock software, a light weight, reliable and easy to use time clock software. It’s an attractive, easy-to-use virtual time clock on the desktop. LionClock saves many hours of time since you won’t have to calculate your employees working hours manually. It helps you to forget about your time and attendance problems allowing you to concentrate on your business critical activities. LionClock 2011 is the latest version of LionClock software version 4.5 which is released on 7th January 2011. It can run on any PC with the following operating systems: Windows 95/98/ME/NT/2000/XP/2003/Vista and Windows 7. Even if you have an old computer sitting around, just install LionClock and it should load in just fine. Every company is different. A small store may only have a single computer where as a networked office environment may have many employees and many computer systems in a network. To cater these two primary needs, LionClock 2011 comes in two editions. Using LionClock 2011 Std version, one can manage up to 150 employees. However, it only works on a single computer. 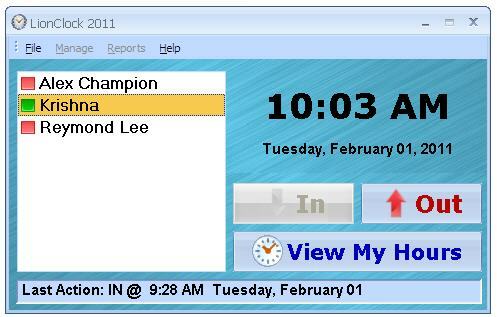 The LionClock 2011 Pro version can support up to 200 employees and can work within a local network. 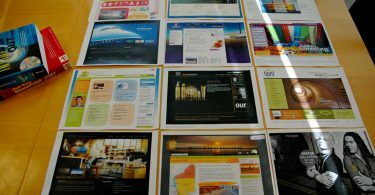 We have downloaded and evaluated the demo versions of both Standard as well as Pro version of LionClock 2011. No features were removed from the demo version of LionClock 2011. However, it allows you to manage up to 3 employees only. Purchasing a license will allow you to manage up to 150 employees (Standard Edition) or 200 employees (Pro Edition). The user interface is sleek and well designed. Moreover, the built-in Help file is thorough and well written. Lion Clock 2011 is also easy to setup and install. With a few mouse clicks, the installation is done. LionClock 2011 operates in two modes. LionClock Server is a mode within Lion Clock 2011 for the administrators. It contains all the standard functionalities for adding and editing employee information and running payroll reports. Admins can also view an employee’s status begin checking out who’s currently in or out. Employees on the other hand will clock in using the LionClock Client mode. They simply click on a button and enter their PIN number to clock in or out. 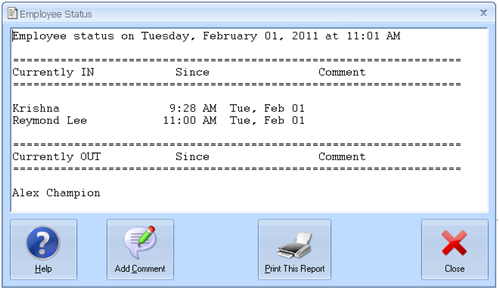 Employees can also view and print their timecard from the LionClock Client. The user interface for clients, works in two modes. The employee list mode allows employees to clock IN and OUT by selecting their name from the list and using the punch buttons. To use LionClock 2011 in employee list mode, go to Manage – Options – Interface Tab. The keypad mode allows employees to clock IN and OUT by entering their badge number. In this mode, no employee list is displayed. To use LionClock 2011 in keypad mode, go to Manage – Options – Interface Tab. In LionClock Pro version, the server software is deployed on the server. Where as the client software is deployed on the client’s machine. 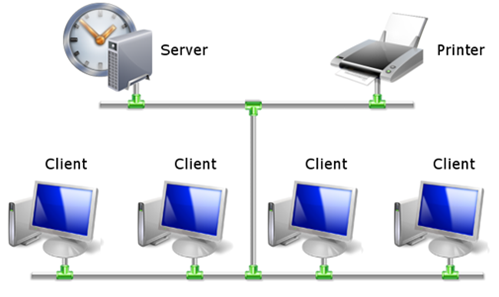 Management of the client’s connectivity with server will happen through the IP address pointing, go to Manage – Options Tab. 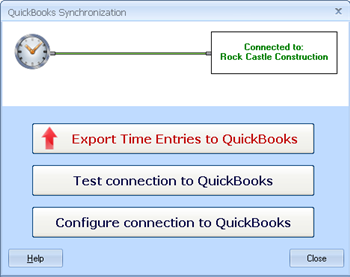 LionClock 2011 can also integrate and synchronize with certain accounting softwares including Quickbooks and Microsoft Office. However, it doesn’t have vacation and leave management of employees and hence it does not track vacation and sick leaves and has limited reporting capabilities. We observed that LionClock 2011 installs a desktop shortcut icon without asking and leaves the installation folder behind upon removal. Nonetheless, we highly recommend LionClock to anyone seeking a better way to track their employees’ time.